CSA season is upon us. Baskets and pick ups will begin soon. For us, we still get our Friends and Farms weekly small basket. Which will soon change to an individual basket, if we hear that Lancaster Farm Fresh got enough people to keep our CSA alive. One week to go for that decision. 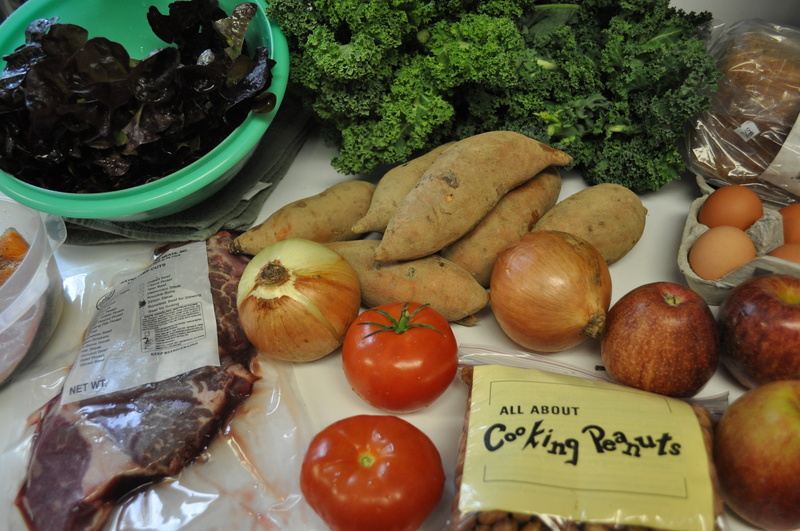 In the meantime, Friends and Farms continues to deliver their quality product. This week, much more on the fresh front. The wide angle view of the entire May 1 delivery. Arctic char. 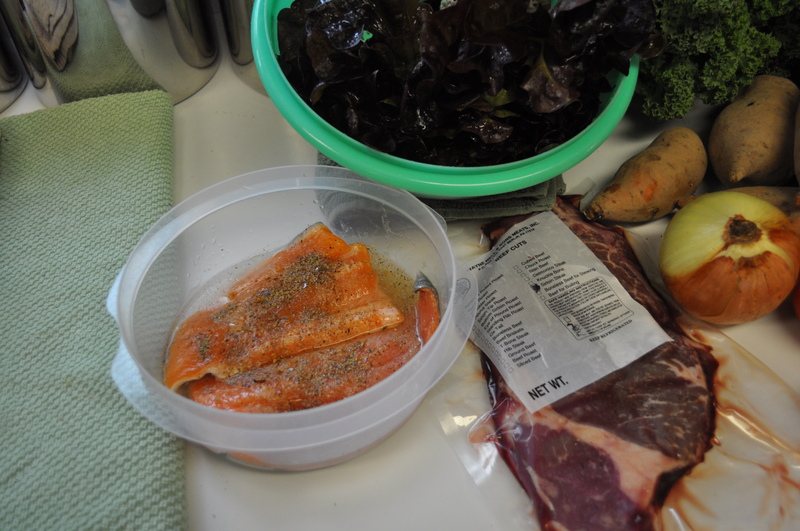 Which almost immediately was being marinated in wine, oil and spices. Next to the char was the package of sirloin steaks. They were the proteins this week. Well, except for the ewe crème cheese and the eggs. 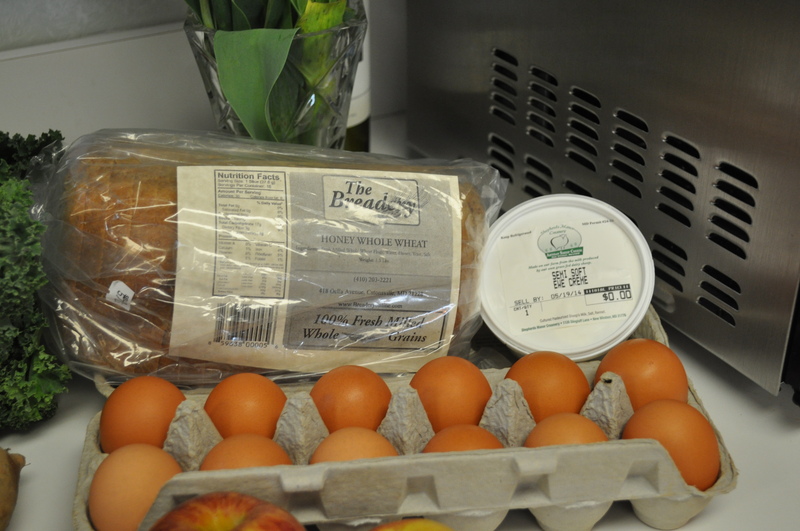 And the usual bread, this week honey whole wheat, rounded out the non vegetable and fruit items. Moving on to the veggies. Red leaf lettuce. Greenhouse tomatoes. Sweet potatoes. A boatload of kale. Onions. Apples. Oh, almost forgot about one of my favorites. The raw Virginia peanuts. There is nothing like roasting spiced peanuts, or maybe getting bold enough to make peanut butter. The peanuts have a sheet with the recipes. This week is serious small plate heaven. The cheese. Perfect for crackers. With some of my famous (?) habanero jelly on it. Peanuts. Sit out on the patio and have a snack with a beer. Kale. I like this kale for kale chips. Posted in Food, Friends and Farms, Locavore, Real Food and tagged cooking, Food, foodie, real food. Bookmark the permalink. What’s in my basket? NOTHING! Whine whine whine, still have 4 weeks until the first CSA delivery. That should be enough time for me to finish emptying out the freezer from the dregs of last season (I even have a butternut squash left in the Strategic Winter Squash Reserve!). I am so psyched. Friends and Farms individual basket, and small share CSA. With an add on of cheese and chicken. Yum! 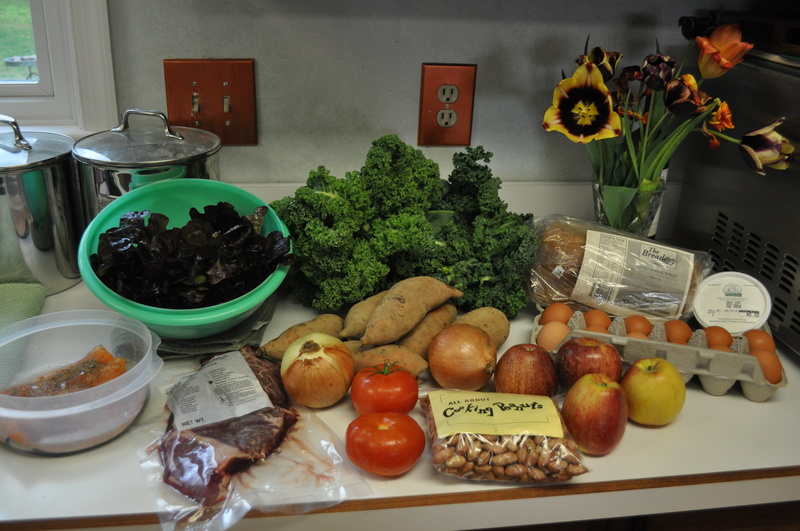 I’m also between CSAs, emptying the freezer, and hoping my summer CSA gets enough sign-ups at MOM’s in Jessup to avoid that site being cancelled as a pick-up location. Last time I was there I saw signs offering a half-share, as well as the usual full-share. Thank you for the recent info about the farmer’s markets. We got our email today. We made it to the limit. Thursday pickups again. I am happy. Thanks to your posts, we’ve decided to give Friend & Farms a try. So far we love it! What a great system, so much flexibility.